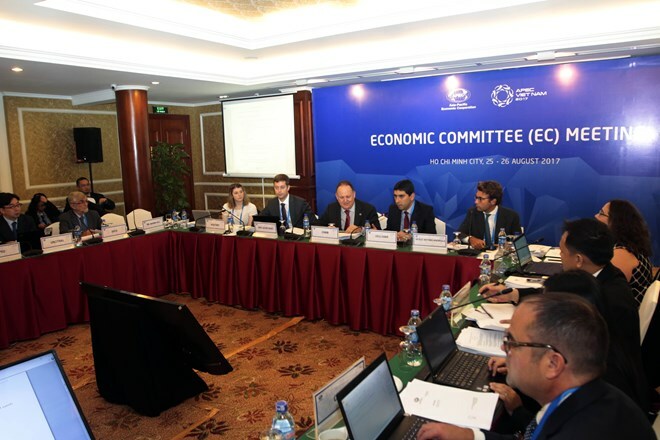 HCM City (VNA) – The APEC Economic Committee (EC) convened its second plenary meeting and the fifth meeting of the Friends of the Chair (FotC) on August 25, discussing the making of regulations and policies to boost development in APEC member economies. The events were part of the third APEC Senior Officials’ Meeting (SOM 3) and related meetings in Ho Chi Minh City. At the second plenary meeting on August 25-26, the EC is set to consider a draft report on APEC’s economic policy on human resources development and structural reform. It will mull over the outcomes of competition assessment conducted by the Organisation for Economic Cooperation and Development (OECD) and the APEC Competition Policy and Law Group. The committee will also look into preparations for a high-level structural reform officials’ meeting. At the FotC’s fifth meeting, delegates exchanged views on APEC economies’ cooperation prospects and policies on investment in economic finance in the region. They were also updated on APEC’s structure and cooperation in online dispute settlement.